The title is suggestive of a variety of topics. However, this round of “Critical Mass” talk is directed at the attainment and sustaining of quality antlered animals on your particular plot or hunting right. I can fully relate with what many of you may feel right now that are not directly in control of your hunting lands. Perhaps you hunt State or Federal land and don’t have the ability to make Land Management or Wildlife Management decisions for the betterment of the herd. While this installment is geared to those who can make the “calls”, it will also offer valuable information to those who do not, to make better assessments of QDM (Quality Deer Management) programs or of the quality of their state run GMI (Game Management Initiatives). Antler Development, also known as Antler Physiology, is indeed an art within itself. Building critical antler mass takes a system and most importantly, a mastery of each step of that system. There exists three vary basic components that are required in this process to aid in creating a smooth running trophy herd. Step 1: Gaining basic understanding of antler composition. Step 2: Identifying those learning’s in the field when looking over your herd. Step 3: Having the self-control to manage the processes required, influencing the outcome. Taking each of these steps in order we will shed some light on this very core process of what makes an environment that helps promote big Bucks and Bulls. Antlers, simply put, are a series of blood capillaries that pile upon each other, following a genetically driven road map, and protected by a sheath of velvety scabbing until the antler reaches a specific hardness. During that development stage, the antler is very sensitive. It would best be compared to having many exposed nerve endings that are highly susceptible to deformation by being bumped or by sustained injuries to the body during the development time. These developing antlers are protected as much as possible by the animal from limbs, snags and parasites that fly or crawl. Even the simple act of bedding becomes a serious consideration for the animal during this time. New growth can be measurable within the time frame of a day in some species. Wind swept slopes and open spaces can be prime, natural locations that help keep fly’s away from growing antlers, as well as simplify daily movement without obstacles. This being the case is where you may look in seeking out your antler growing trophies during certain critical times. The antlers in their blood-engorged state, are quite heavy and burdensome, weighing as much as two times their dry weight (after being cast off). This extra weight is a strain on the animal and can also be a factor as to how much travel the animal is willing to do and where and how it chooses to spend it’s energy for the day. Once the antler has stopped growing and begins to dry, the velvet begins to peel, much like a scab from a skinned knee. The desire to rub the antler, removing the velvet, becomes overpowering. The exposed antler is the first sign of dominance that the animal will have in the pecking order. The animal will then spend a great deal of time rubbing the remaining velvet off, utilizing certain sap producing trees to darken and shine the antler in making a statement to others who may choose to challenge him. As the animals are observed in the field during this time, a great deal can be learned about the quality of the finished antler product. Many outdoorspeople tend to spend little or no time scouting during this time of year and they really should be. This needed scouting is however, a double-edged sword. While it is best not to disrupt the animals as they try to avoid damage to growing antlers that can occur when fleeing from research endeavors (ultimately defeating the process), in order to identify the elements of this study of Antler Physiology the observation becomes necessity. There are ways and tools that can help minimize the intrusion. Example, the use of a spotting scope in combination with a carefully planned travel route will lessen impact. As I said before, the animals will try to utilize open spaces to take advantage of the wind in keeping the fly’s moving and off the growing antler. This exposure makes them a bit easier to find. Once located, an attempt to determine the maturity of the animal becomes the next task. I have a process that I like to use that seems to work pretty well in identifying young or yearlings from older animals. If you spend some time looking over animals of various age groups within a species, you may notice that the young of the group tend to have shorter snouts, where this feature tends to elongate with older age class animals. Another indicator is in how much sway may exist in the animals back from years of carrying young and general internal organ weight of older and larger animals. While these are not hard fast rules, check it out and see if you agree. With a rough means to identify a younger animal and this being a critical time in antler development, we can now begin to look for the fork horned and/or well-defined yearling racks that will be a stronger indication of great future genetic value and massive antler growth. On the converse, we can identify the long-snouted, sway spine’s with little or no fork protrusions that are carrying the herds inferior genetics. Studies have proven that yearlings with well-defined and symmetrical racks grow to be adult animals with superior genetics to pass along. This critical time frame also allows the scout to identify deficiencies in the plot nutrition that is available and react by supplementing accordingly. I continually stress the importance of a nutritional understanding and its role in the enhancement of habitat. During this time of the cycle, the only energy that will be diverted within the animals body to add to antler mass, will be that energy that exists over and above the daily need for sustenance. So if the nutrition is lacking, the antlers will be lacking as well. Let’s not forget about observing the breeding females during this process. Can the nurturing female that birthed the genetically desirable animal be identified, and her nutrient needs met today and for future breeding? Can her diet achieve the best quality foods to promote embryo development and lactation? These are the areas that a good land manager will be sure to cover if they want to promote quality antlers. This is probably the toughest part of the process. It, being the point in which certain animals may need to be identified for harvest. This means on both sides of the spectrum of male and female, superior and inferior. 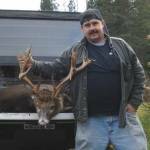 The inferior bucks or bulls need to be identified and removed from the breeding forum. As well, older doe’s and cows will need to be harvested to allow the fertile younger females to reproduce. This is the piece of many QDM proposals that folks struggle with. Too often are older and inferior females able to continue to receive and stagnate good genetic offerings. It may be necessary to pass up a small six point buck and take table meat for a couple of years. When filling a doe tag and the scope has many options as you glass a group of doe’s, all appearing to be close in size, a good understanding of the snout/sway system should aid in putting the older of the animals down. Educating yourself in nutrition and food plotting will allow for augmenting the nutrient value that may be deficient, until more natural landscape enhancements can be made. This education will require drive and determination to learn, as it can be very dry material to master and a great deal of work. Scouting all year is the discipline of the scout, while maintaining total regard for stressing and habitat infringement, identifying the quarks and habits of your particular herd. Truly being able to identify with the statement “The one thing you always know, is that you don’t always know”, no one does and should not be expected too. Understanding that this is a process of theories and the only right answer is what is right for your particular area, will be the wisdom that will make you a proficient land manager. Too often people look to folks like myself who are willing to share information and become quick to criticize when the elements don’t fall together exactly as we say they “should”. This explains why it feels like you never get a straight answer from us. We know how broad the rule can get. While some rules are hard and fast, many occupy the grayest zone. In conclusion, I want to summarize that the three primary aspects of good trophy antler development rest in Nutrition, Age and Genetics. Mature animals yield the best antlers hands down and they need to reach that maturity. However, at a certain point they begin to digress in their production and will need to be eliminated from the breeding herd as well. A good crop of fully mature animals in the 7-9 year age class will be invaluable. Animals that get superior nutrition will have the best chance of utilizing what nature gives them to the fullest potential (e.g. healthy young and extra energy to turn into antler mass versus basic sustenance). Lastly, identifying your true breeding cross section and supporting that group, while eliminating those that help fashion the curve will guarantee superior genetic value and achieve the critical mass we all seek.